Remote Desktop Licensing (RD Licensing) is a Remote Desktop Services role service that is included with Windows Server® 2012. RD Licensing manages the licenses that are required to connect to a session-based desktop or a virtual desktop. You can use RD Licensing to install, issue, and track the availability and usage of licenses. This paper contains instructions for setting up a test lab based on the Test Lab Guide: Remote Desktop Services Session Virtualization Standard Deployment or Test Lab Guide: Managed Pooled Virtual Desktop Collections and installing and configuring licensing for Remote Desktop Services using four server computers. The resulting test lab demonstrates how to successfully install and configure licensing for Remote Desktop Services. The following instructions are for configuring the Remote Desktop Services Licensing test lab using the minimum number of computers. Individual computers are needed to separate the services provided on the network and to clearly show the desired functionality. This configuration is neither designed to reflect best practices nor does it reflect a desired or recommended configuration for a production network. The configuration, including IP addresses and all other configuration parameters, is designed only to work on a separate test lab network. One computer running Windows Server 2012 named DC1 that is configured as an intranet domain controller, Domain Name System (DNS) server, Dynamic Host Configuration Protocol (DHCP) server, and an enterprise root certification authority (CA). One intranet member server running Windows Server 2012 named RDVH1 that is configured as the Remote Desktop Virtualization Host (RD Virtualization Host) server. One intranet member server running Windows Server 2012 named RDWA1 that is configured as the Remote Desktop Web Access (RD Web Access) server. 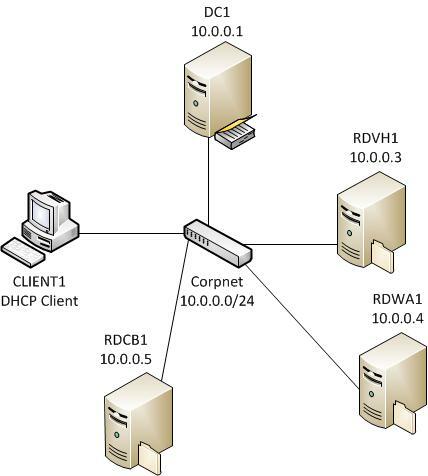 One intranet member server running Windows Server 2012 named RDCB1 that is configured as the Remote Desktop Connection Broker (RD Connection Broker) and the Remote Desktop Services Licensing server. The Remote Desktop Services Licensing test lab consists of 1 subnet (10.0.0.0/24) that simulates an intranet named Corpnet. Computers are connected to each other by using a Hyper-V virtual switch. See the following figure. You must have a network shared folder that is configured to store user profile disks. All RD Virtualization Host computer accounts must have the ability to read and write to this location. The product disc or files for Windows Server 2012. The product disc or files for Windows 8. A physical computer that meet the minimum hardware requirements for Windows Server 2012. There are 7 steps to follow when you set up Remote Desktop Services Licensing test lab based on the Test Lab Guide: Remote Desktop Services Session Virtualization Standard Deployment or Test Lab Guide: Managed Pooled Virtual Desktop Collections. Step 1: Complete the Demonstrate Remote Desktop Services Session Virtualization Standard Deployment Test Lab -- The Publishing test lab requires the Demonstrate Remote Desktop Services Session Virtualization Standard Deployment test lab as its starting point. Step 2: Install the RD Licensing role service – Install the RD Licensing role service on RDCB1. Step 3: Activate the Remote Desktop license server – Activate the Remote Desktop license server to certify the license server. Step 4: Request RDS Beta CALs – Request Beta licenses for the Remote Desktop license server. Step 5: Install RDS CALs on the Remote Desktop license server -- Install RDS CALs to allow the license server to issue Remote Desktop Services licenses to clients. Step 7: Snapshot the configuration -- At the completion of the lab, snapshot the configuration so that you can later return to a working Session Virtualization deployment Test Lab. You must be logged on as a member of the Domain Admins group or a member of the Administrators group on each computer to complete the tasks described in this guide. If you cannot complete a task while you are logged on with an account that is a member of the Administrators group, try performing the task while you are logged on with an account that is a member of the Domain Admins group. This Test Lab Guide uses the Demonstrate Remote Desktop Services Session Virtualization Standard Deployment test lab as a starting place. Please complete the steps in Test Lab Guide: Remote Desktop Services Session Virtualization Standard Deployment or Test Lab Guide: Managed Pooled Virtual Desktop Collections before proceeding with the remainder of the steps in this guide. If you have already completed the steps in the Demonstrate Remote Desktop Services Session Virtualization Standard Deployment Test Lab Guide and saved a disk image or a virtual machine snapshot of the Demonstrate Remote Desktop Services Session Virtualization Standard Deployment, then you can restore the Configuration and proceed to the next step. Install the RD Licensing role service on the RDCB1 server. Log on to the RDCB1 server as the CORP\Administrator user account. Server Manager will start automatically. If it does not automatically start, click Start, type servermanager.exe, and then click Server Manager. On the left side of the window, click Remote Desktop Services, and then click Overview. Under Deployment Overview, click the + icon above RD Licensing. On the Select a server page, click RDCB1.corp.contoso.com, click the right arrow, and then click Next. On the Confirm selections page, verify the RD Licensing role service will be installed, and then click Add. On the View progress page, confirm the installation of the RD Licensing role service was successful, and then click Close. Activate the Remote Desktop license server. A license server must be activated to certify the license server and prepare the license server to issue Remote Desktop Services client access licenses (RDS CALs), or VDI Suite licenses. On the left side of the window, click Remote Desktop Services. Right-click RDCB1, and then click RD Licensing Manager. Right-click RDCB1, and then click Activate Server. The Activate Server Wizard starts. In the Activate Server Wizard, on the Welcome to the Activate Server Wizard page, click Next. On the Connection Method page, in the Connection method: drop-down list, select Automatic connection (recommended), and then click Next. On the Company Information page, enter your First Name:, Last Name:, and Company:, select your Country or Region: from the drop-down list, and then click Next. On the Company Information optional information page, specify any other information that you want to provide, such as Email:, and Company address:, and then click Next. On the Completing the Activate Server Wizard page, ensure that the Start Install Licenses Wizard now check box is cleared, and then click Next. Request RDS CALs over the Internet. Open Internet Explorer. To open Internet Explorer, click Start, and then click Internet Explorer. In the Internet Explorer address bar, type https://licensecode.one.microsoft.com/ and then press Enter. Source: Select your beta/evaluation source. License Type: You have the choice to select Per User CALs or Per Device CALs. eMail Address: Select an email address to receive the RDS CALs. On the Confirm License Code Request page, re-enter the email address and ensure that the information you provided in the confirm section is correct. Enter the capcha code and then click Submit. You will receive an email from RDSLMIC (it may end up in your junk folder) with a 5x5 Beta evaluation license key. Enter the 5x5 Beta evaluation license key that you received by email, click Add, and then click Next. Use the appropriate deployment guide to verify client connectivity. After client connectivity has been established, verify the RDS CAL by using Remote Desktop Licensing Manager. In the console tree, expand All servers, and then click RDCB1. In the results pane, verify that a license is used in the Issued column. If your lab is based on virtual machines, save a snapshot of each virtual machine and name the snapshots Remote Desktop Services Licensing. If your lab uses physical computers, create disk images to save the Remote Desktop Services Licensing test lab configuration.